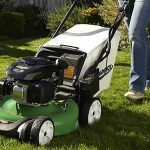 A riding lawnmower is designed to be a practical tool, but it can also be an enjoyable experience if you like getting out in the fresh air. I would say the world is probably split between those people who love mowing the lawn and those people that dread it. The best thing about a riding lawnmower is that even those that aren’t all that excited about the prospects of cutting the lawn don’t usually mind doing the job if they can hop on one of these. If you’re in the market for a riding lawnmower that gets the job done but doesn’t break the bank, the Troy-Bilt 420cc is an option you may want to consider. 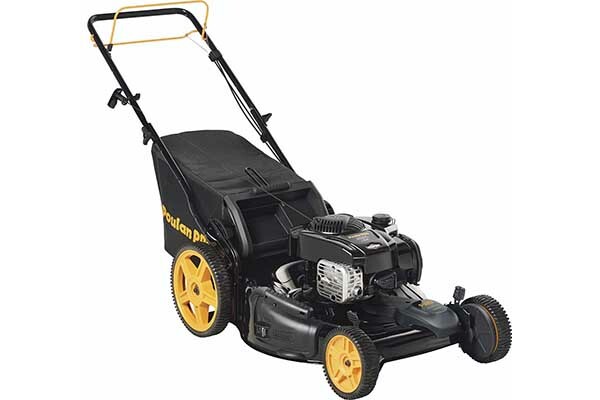 This is a no nonsense machine built for cutting a large lawn and its price tag is very reasonable at well under $1500. 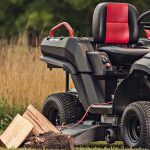 For a riding lawnmower to do the job properly it has to have a powerful enough engine to get around a large property in a reasonable amount of time. 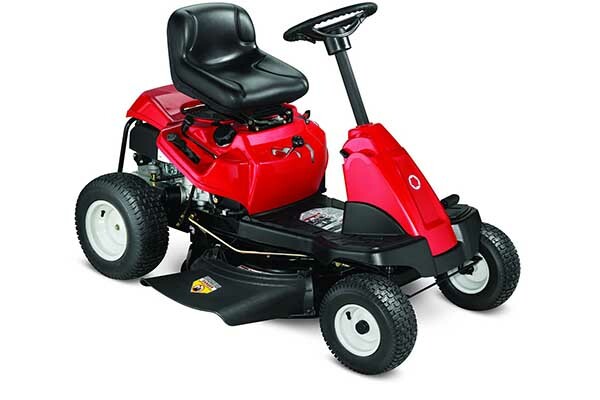 This particular model by Troy Bilt comes equipped with a 420 cc engine which is more than capable of providing enough power to cut a large lawn. One of the last things you want to be doing when you’re using a riding lawnmower is fiddling around with the blades to make them engage. This machine comes with a manual power takeoff for fast and easy Blade engagement. 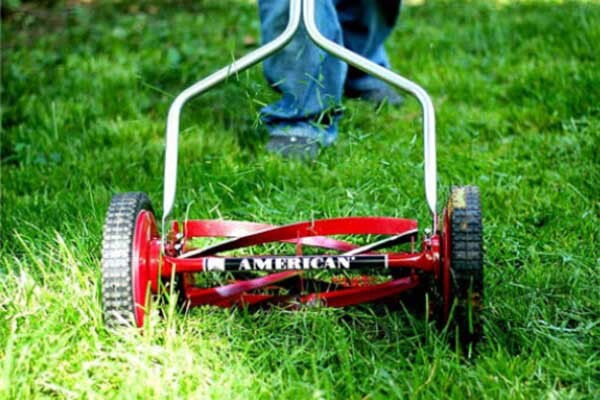 You can spend your time cutting your lawn and not worrying about if you’re blades are engaging properly. A problem that’s of concern for some riding lawnmowers is that the cutting deck is often considered a little narrow. 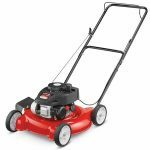 The cutting deck on the Troy-Bilt 420cc is about 30 inches wide, which is probably about the perfect width and comparable to most standard lawnmowers which you push yourself. 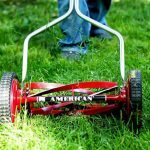 If you ever had the pleasure of using a riding lawnmower in the past you’re probably aware that they didn’t always have the best turning radius, which could make things difficult when you got in those tight areas. 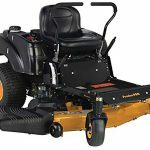 This mower has a turning radius of about 18 inches, which is a lot better than what you would’ve seen in the past, but not the best around by any means. The warranty on this machine is just okay. 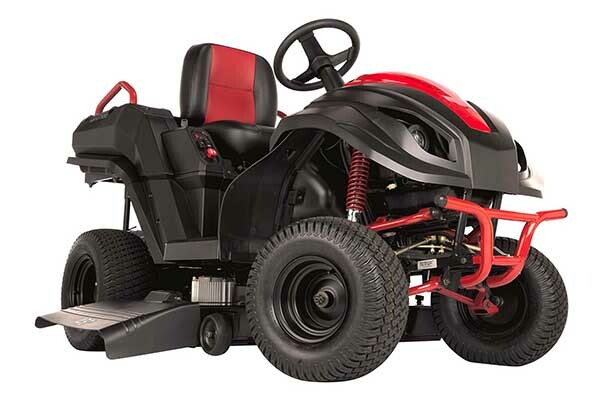 When you purchase this Troy-Bilt riding mower it comes with a standard warranty of two years – that’s probably adequate as in most cases generally if something is going to go wrong it’s likely to happen in the first two years. But, in my mind, if you’re paying in excess of $1000 for a machine I would expect to see a warranty of at least five years or more. While this machine doesn’t come with an attached towing bed or plow it does have a towing bracket or hitch connection that you can use to hook one of these up. You’re likely going to have to be a little bit handy if you’re going to do this, but it’s nice to have the option. 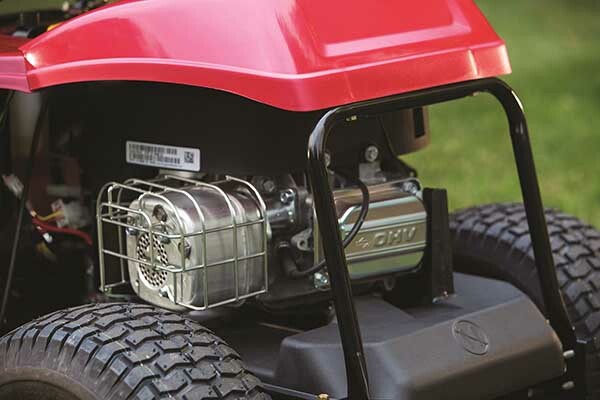 When spring rolls around before you begin your regular lawn cutting routine for the season, it’s a good idea to hit the mulch option and this Troy-Bilt mower does come with this capacity. In fact, when you first power it up it’s already set in mulch mode and ready to go. We’re not all the same size and it can be a little frustrating trying to get comfortable on a riding mower if it isn’t really designed with your height in mind. This mower has an adjustable seat which makes it straightforward to readjust so it suits your own particular height and stature. It might seem like a minor feature, but it can probably save your back a lot of unnecessary pain. If you like to think of yourself as the next Mario Andretti then this may not be the mower you’re looking for. 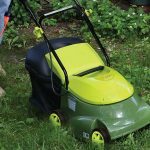 This is designed as a practical tool for cutting your lawn and not as a hybrid crossover vehicle that you can use for cruising around the back of the property. Its top speed is about 4.25 mph which is more than adequate for a riding lawnmower, but not if you want to use it for anything else. One of the biggest complaints that has been leveled at this mower is that the shifter isn’t easy to use. It’s described as awkward and positioned in the wrong place for easy access. That to me was a big disappointment, as the idea of a riding lawnmower is to make your life easier and not harder. Preferably, you want a shifter that almost does the job itself, so this was definitely a disappointment. While this machine can handle relatively tight turns, as we’ve already mentioned, you probably don’t want to do that on a hill. More than one customer has described this machine as a little tippy, so turning on uneven ground is probably not a good idea. 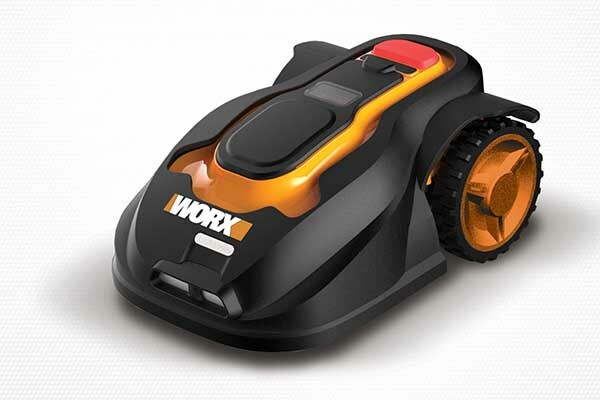 Ideally this mower is designed for flat surfaces, but it can probably handle hilly areas if you’re careful. 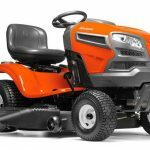 If you’re looking for a riding lawnmower that can get the job done on a reasonable budget then the Troy-Bilt 420cc should certainly be in the running. It’s probably one of the least expensive riding lawnmowers on the market these days and it does a pretty good job of cutting the lawn. However, the fact that it’s a little tippy in nature and that the gear shift is little awkward is certainly cause to make you think carefully about purchasing this model.